We are currently developing our range of inclusive cookery lessons for schools and groups. Our offering will include after-school cookery lessons and private tuition with clients as they approach school-leaving age. We believe that early intervention, particularly as young people transition from full time education to independent living, is pivotal in establishing healthy eating practices. If you are a school or community group in the Bath & North East Somerset area, please contact us to learn more about partnering with us to offer an after-school club. 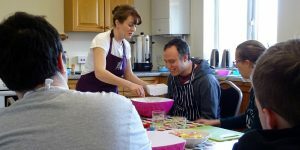 Our inclusive cookery lessons increase self-esteem, develop social skills, increase confidence to try new things, increase personal resilience and flexibility, and offer a fun learning experience. Participants will learn new techniques, experiment with new or unfamiliar ingredients, gain an appreciation of food provenance and seasonality, understand the importance of nutritional balance and portion control, learn safe and hygienic methods of cooking and build healthy eating routines. If you are a parent of a young person with learning and communication difficulties or ASD and want to know if your child’s school could partner with us to offer an after-school club, contact us and we will be happy to set up an exploratory meeting with them.